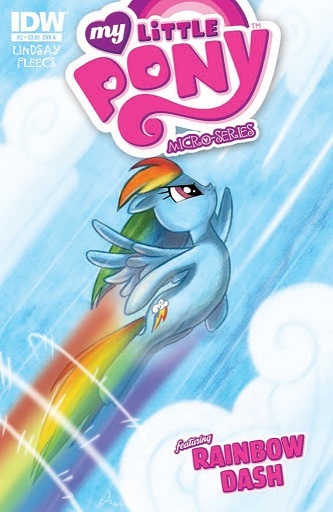 In this issue, we have two finales; that of the Teenage Mutant Ninja Turtles arc “Krang Wars” and the series finale for Hack/Slash, which is even called “Finale.” Then, we have Rainbow Dash in her entry to the My Little Pony: Micro-Series. So, I guess, thematically, Dash’s pet Tank is a tortoise, which is easily confused with a turtle – so that’s kind of like TMNT, right? Who cares; I’ve never worried about connective theming before. Let’s get to the reviews. This is it, the final issue. It ends the only way the slasher genre can; with a knife going up, and a knife going down. Again and again. Repeatedly. 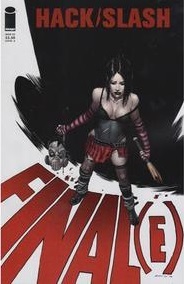 It’s a horror story; it’s surprising how many of the characters made it after the first issue of this final arc. There’s one final death that, while well within the realm of genre possibility, is still shocking. The book ends with a few quick “behind the scenes” notes; it reveals that both Cat Curio and Pooch were meant to die for real at the end of their original storylines, but they became survivors in their own right, and play a big part in this finale. Though Cassie is the main character, and events conspired to make the final confrontation personal, Akakios didn’t really figure into Cassie’s origin story. Cat’s arc is more directly involved; Cassie essentially becomes Cat’s weapon against her own personal boogeyman. Of course, this is a slasher, so there’s got to be a sequel, and though the story ends on a mostly happy note, there is a sequel hook. There’s always a sequel hook. And now for something … wait, I already did this joke. This issue, written by Ryan K. Lindsay, is kind of weird. It features Rainbow Dash trying to stop a pair of gremlins who, I think, eat not-happy thoughts (or something). They live in a cloud, and since Rainbow Dash is in charge of the weather, when this giant black cloud makes everybody gloomy (I’m not typing “everypony”), she keeps trying and failing to get the cloud to go away. It’s kind of hilarious, actually. The jokes are mostly terrible in a “the joke is that the joke is terrible” way; Rainbow Dash babbling about “boss” pink bicycle baskets is a good example. The gremlins quote everything from Blade Runner (I’m not sure it that’s even appropriate) to A Midsummer Night’s Dream – way to keep the pop culture references recent. Like Rainbow Dash trying everything to make the cloud go away, Lindsay tries everything to make the reader smile. Eventually, it works. Tony Fleecs is on art; it seems more like the show than past issues (lines are colored, not black), though background characters tend to have really long necks. 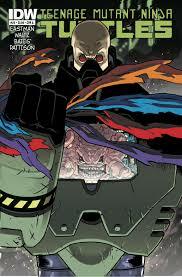 This is the final issue of the “Krang Wars” arc, so it’s mostly just action set piece after action set piece, with just fun, goofy sci-fi fights between talking turtles and brains in robot suits. This is Ben Bates’ last issue for now, and he gets to finish with a bang. This arc is pure comic book silliness; that’s a plus in this reviewer’s book. In spite of that, (or maybe even because of, because at this point, why not? ), the issue deals with issues of faith. Donatello and the Fugitoid are putting the final touches on a weapon that will stop the war in its tracks, when Donnie mentions Splinter’s theories that he and his brothers are the reincarnated forms of a family from feudal Japan. Donatello is stunned to find the alien/robot/scientist Fugitoid’s response to this theory is basically, sure, it could happen. The thing about fictional non-believers is they are always wrong; from a story standpoint, a world with something is always more interesting than a world without something (in this case, reincarnation). It’s a weird meta-moment right there in the middle of the issue; we know Donatello the fictional disbeliever is wrong, because this is a fiction, we’ve literally seen the reincarnation happen in earlier issues, and, honestly, reincarnation is the least weird thing about this situation. This is a really weird place for a discussion of faith, or lack thereof, but it somehow manages to not feel out of place. We’ve followed this far; the reader of a book called Teenage Mutant Ninja Turtles has to accept plenty of bizarre concepts on faith for the story to work, after all.